Lots of questions about the exhibition so I thought I’d try to cover them in the blog. What period will it cover ? It will cover from the early sixties to the present. The tricky bit was always going to be the sixties. I moved to Edinburgh in 1977 and Avalanche opened in 1984 so a large chunk of trying to cover from the early 60s to the modern day was within my own experience. Early on I found interesting gigs in which bands that would go on to be huge played small places. 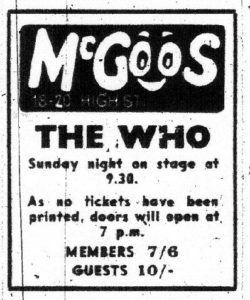 The Who playing McGoos in the High Street or The Beatlers appearing in Elgin are good examples. What was lacking was enough material and information about the Scottish bands of that time as there were few recordings and only a handful of band members went on to be involved in music into the seventies. However after the last article in The Evening News several folk came forward and could not be more helpful. It is always good to get a thread that ties things together and Pete Seaton’s musical instrument shop was clearly an incredibly important part of the scene. I was lucky enough to meet up with his son Murray who many will know for his drum shop and then have a chat with Ian Orr singer with Edinburgh beat group The Athenians who recorded the very first Scottish single and Ian only confirmed the importance of Pete’s shop. And it isn’t just Edinburgh bands of course. The west coast had The Beatstalkers and The Poets and Hawick the psych band The Ceiling Light Machine. The Beatstalkers bass player Alan Mair went on to play with The Only Ones ! From the sixties we can then move forward to Rollermania and other bands like Pilot with links back to the sixties. Don’t worry I would never ever forget Alex Harvey and SAHB. You have to watch the dance routine !